Multi-generational! Ages 8 & up-children under the age of 13 must be accompanied by an adult. 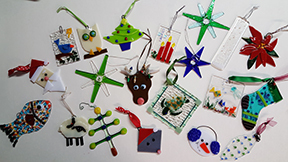 Get a jump start on your holiday gifts by joining this festive ornament making workshop! Take inspiration from a variety of patterns or use pre-cut glass bases to build your own unique holiday gift or keepsake. We will provide all materials needed and will teach basic glass cutting skills. You can expect to complete 2/3 projects. No previous experience necessary. There will be optional specialty glass available for an extra fee. You may create more than three for the additional cost of $15.00 per ornament. Please wear closed shoes and long pants.